Another month, another Brooks Running review! 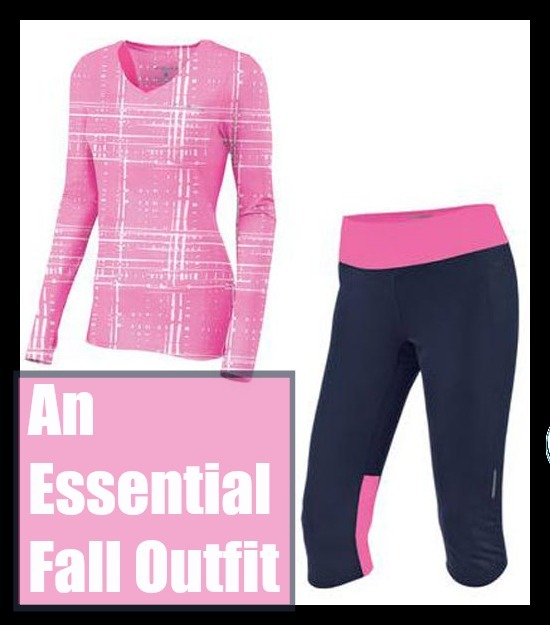 And this one is perfect for a warmer fall day or an indoor run on the treadie! And remember, we are a Brooks Running blog ambassador, but these product reviews are totally our honest opinions! Besides just being plain cute, the Equilibrium LS II top is super smooth and almost silky. Great as a base layer or on its own (Oh! Or under this vest that I LOVE), it’s soft, a little stretchy and just feels good on. With thumbholes (yes! ), there are mesh panels on the back and under the arms to keep you cool and the fabric wicks away moisture. There are flatlock seams, so no risk of chafing, and it has that really, really cool retroreflectivity going on. We really dig the slight v-neck, antimicrobial fabric (no stinkiness!) and how the fit is fitted but not too fitted. For $50, it’s a great piece! Capris can sometimes be a dime a dozen — or, you know, a $100 a pair — but the Brooks Running Essential Capris are a really quality running capri. With a $65 price tag, they’re a little shorter than my normal capris (hit just under the knee) but have a slight flare and a really, really comfortable fit that stays in place. The wide waistband is flattering, the fabric is soft (especially behind the knees — nice touch there), and there’s an invisible back pocket with a zip that’s waterproof (can’t get too sweaty!). Also, all of the seams are flatlock and there’s an inner gusset — a must to prevent chafing and comfort of the lady parts. Oh, and this one has the retroreflectivity going on, too. And this isn’t quite as technical as the rest of the features, but we really like that these are offered in navy, in addition to black. Nice to give a gal another color option! Wow, I just love this set, most probably because it’s pink but the plaid-like design is very cool. Yay for antimicrobial fabric too.